“One type of laziness is based on doubt: “How could I ever do this?” You put yourself down, and even feel special in considering yourself so low and incapable. To overcome this requires courage. Discover your natural dignity. Feel the preciousness of this moment: how amazing it is to be alive! If you understand the truth of this, there’s nothing that you can’t accomplish. That’s exactly what the Buddha and many other great masters did. They worked on the basis of this inspiration. Since we all have buddha-nature and inherent wisdom, why can’t we do as they did? We need to apply ourselves diligently and engage in our practice fearlessly. Another type of laziness has to do with attaching to lesser interests and missing the greater opportunity. You know that the practice is special, you have some awareness that this is a very unique moment, and you are inspired by this beautiful opening, but you still waste time and cling to meaningless, worldly involvements. You’re like a cat who is always trying to catch another mouse. Guru Padmasambhava taught that this kind of activity is as endless as waves on the ocean. Just when you think you’re going to finish, the next wave arrives, and then another. There is always something else to do or acquire. This form of laziness involves staying distracted with countless things to achieve and do. There will never come a time when we’ve completed everything. These preoccupations never cease. Unaware of the cause of this unsettledness, we habitually cling to external things and are subject to an endless procession of wandering thoughts and impulsive actions. This happens all the time when we’re attached to external things. If we start looking inwardly, we will discover the source of all these restless feelings. We will also find joy, tranquility, and thoughts that bring peace and harmony. Don’t believe this just because Guru Padmasambhava said it. Look into the history of renowned people, warriors, kings, or those with great artistic talent. All of them died with dreams and projects unfulfilled. Everyone leaves this world with unfinished business. Investigate this for yourself. You’ll find that this is really true. When we see laziness in ourselves, what should we do? Respond immediately and with vigor. Don’t fall for, “I will do it later.” You don’t have to be patient with laziness. Guru Padmasambhava said that when you observe laziness in yourself, act like a timid person who has just discovered that a snake has crawled up into his lap. You would not just sit there to see what the snake does next. You’d get right up, throw it off, and run away! Guru Padmasambhava also said that to overcome laziness you must act immediately, like a beautiful lady whose hair has just caught on fire. These are very clear examples about how to respond to laziness. Photo of the Ven. 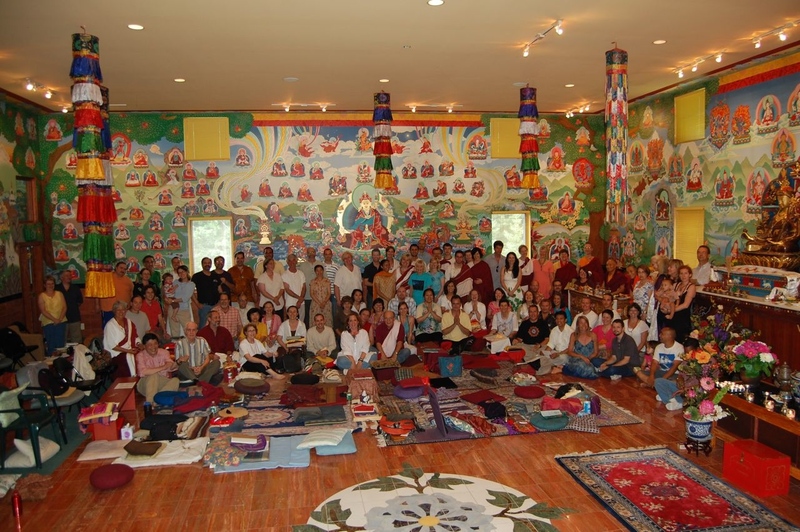 Khenpo Rinpoches bestowing the Eight Herukas empowerment at Padma Samye Ling in 2008.